You don’t need to get clothes that have been designed for travelling. You could spend a fortune on buying The North Face walking pants, Craghoppers anti malaria shirts etc. In truth, any old clothes will do. We had a mix of old clothes and some new travel specific clothing. Having some quick drying shirts or T-shirts were useful along with merino thermals. 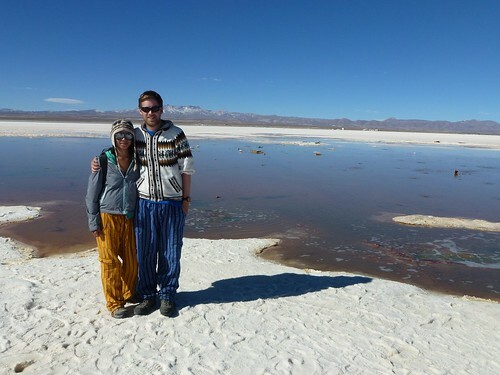 You have to wear local clothes in Boliva to keep warm and look like a backpacker! We faced the problem of being in South America in winter and then going to summer climates in Australia and Asia. Overall we didn’t pack enough warm clothing for South America. We didn’t expect it to be so cold but with many cities being at altitude we were wearing thermals all the time. In the end, we bought some alpaca wool jumpers in Peru which were amazing! They doubled up as being practical AND a great souvenir! If you have been to Peru or Bolivia and not come back with one you’re missing out! By the time we got to New Zealand we ditched the cheaper warm clothes and sent back the alpaca jumpers and expensive thermals and stocked up on shorts and T-shirts. We bought T-shirts along the way in Asia as they are so cheap whilst ditching older T-shirts. You easily get bored of the same T-shirts after 10 months! Zip off trousers were also good. At the halfway point John threw away the bottoms to the trousers and used them just as shorts. One warning to the fellas travelling in Asia – sizes can be a problem for those carrying a bit more weight. You don’t get many fat Thai’s or Vietnamese, mens trousers only went up to 38 inches in some stalls. A general rule is to take around 7-10 days worth of clothes, so 7 pants, 7 socks (not if you’re in a hot county), 7 T-shirts etc. That will last you 6 days, you need a set of clothes to wear on washing day hence 6 days. Alternatively, you can take more clothes but you’ll need a bigger bag which will weigh more. In addition to the clothes, we took 2 stuff sacks each which provided a good way to keep your clothes compact. After a few days one stuff sack has clean clothes and the other dirty. We met an Irish fella who went for the roll and elastic band approach, rolling each item of clothing and then wrapping in a band so he had loads of small bundles of clothes in his backpack. – You don’t need to buy branded and specific travel clothes. – Whites don’t stay white! – You can buy more clothes on the way but if you’re a plus size it could take time to find sizes. – In your backpack use a couple of stuff sacks to keep the clothes compact.